What awards did Christian Yelich win? 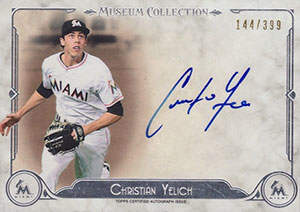 This page lists every known baseball award won by Christian Yelich in chronological order. Click the award name and up comes a comprehensive history of that award along with every winner of that particular baseball award. If you are aware of any other unusual, less known, not as publicized baseball awards won by Christian Yelich please contact us with details. If you are the type of fan who truly enjoys intelligent debate and thinks you can teach others why Christian Yelich did or did not deserve the Gold Glove Award, National League Outfielders in 2014, jous on Baseball Fever .